This gorgeous atlas, illustrated throughout with more than 500 colorful images and maps, provides a visually rich and textually engaging history of the states of Oregon and Washington. Derek Hayes brings his enthusiasm and expertise to a full range of topics, beginning with the first inhabitants and tracing the westward expansion, conflict between settlers and Native Americans, and the establishment of the Oregon Trail. We see in vivid images, old maps, and lively text the coming of the railroads and the rapid establishment of the coastal ports, northwest cities and roads, the fur and lumber industries, and the large farms. We also witness the twentieth-century development of the war industries, the establishment of the aviation industry, and the celebratory 1962 Seattle World’s Fair. 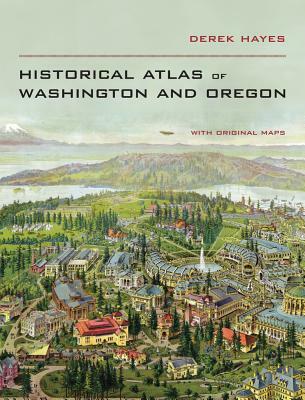 At once a valuable reference and an exhilarating adventure through history, the Historical Atlas of Washington and Oregon presents readers with a fascinating chronicle of how these proud states came into their own and how they each look toward the future. Derek Hayes is a noted historian and the author of numerous historical atlases, including The Historical Atlas of the Northern American Railroad, Historical Atlas of the United States, and Historical Atlas of the American West, all from UC Press.